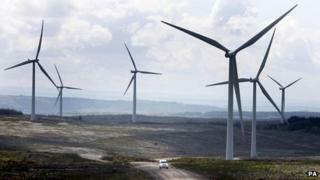 A wind farm near Glasgow has become the first wind energy project in Scotland to join a major tourist attraction body. Managers of the visitor centre at Whitelee, Eaglesham, agreed to become members of the Association of Scottish Visitor Attractions (ASVA). They took the decision after recording nearly 250,000 visitors at Europe's largest onshore wind farm since 2009. The centre is run by ScottishPower Renewables and Glasgow Science Centre. The move comes despite recent claims by US tycoon Donald Trump that wind farm developments would kill off tourism in Scotland. Whitelee's £2m visitor centre includes interactive displays and exhibitions and a learning hub staffed by personnel from Glasgow Science Centre. ScottishPower Renewables said nearly 10,000 pupils had visited Whitelee so far as part of school trips. The company said in addition to centre visits, at least another 100,000 people had accessed the wind farm's 90km (56 miles) of trails for recreational purposes such as jogging and cycling. Project director John Alexander said: "We are very pleased that Whitelee Wind Farm will be joining Scotland's top tourist attractions as a fully fledged member of the ASVA. "It is fantastic that people have shown so much interest in the wind farm, and it has surpassed all of our expectations. "One of our key priorities when building the wind farm was to ensure that it was accessible, and that people could enjoy interacting with it." Tourism Minister Fergus Ewing said he welcomed the wind farm's decision to join ASVA. "Whitelee is creating new opportunities for a wide range of outdoor leisure activities to the south of Glasgow through improved access, a popular visitor centre and great linkages into the education community," he commented. In April, a survey commissioned by VisitScotland suggested tourists visiting Scotland did not see wind farms as a problem. The agency reported that about 80% of respondents said a wind farm would not affect their decision about where to take a holiday.